Did you know that April is National Frog Month? 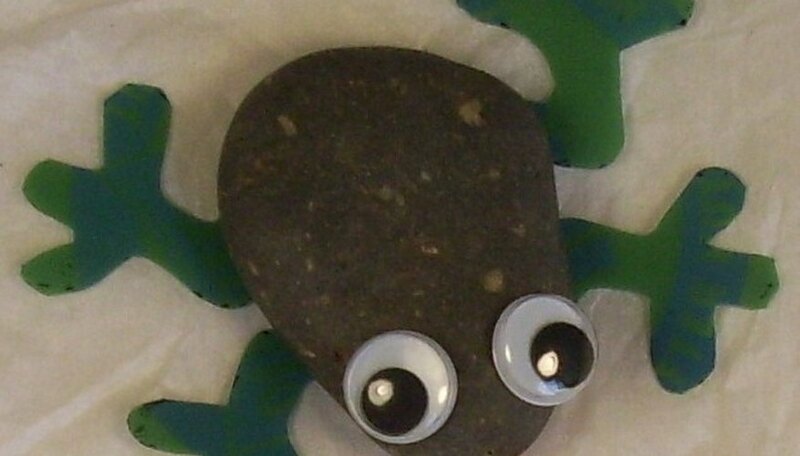 Celebrate by making some "rock frogs" with your students or kids. While you do it, you can talk about endangered frogs and about how we can help them. This project is easy and quick, and can be done even by young children. Pick some smooth river rocks, about 1 1/4 inches long, that are generally "frog shaped." It's good to have several for kids to choose from. Draw legs on a plastic lid (a famous peanut brand comes in green! They're "nut-ritious." However, frogs come in many colors besides green, so have fun.) Cutting the legs is the most difficult part, and might best be done by an adult. I cut the legs myself and gave them toes, but children can make simple legs themselves and draw or glue toes on. Alternately, you may want to make the legs from paper or craft foam, or bend some pipe cleaners. But if you use a lid, you can point out that you're doing the second "R" of reduce-reuse-recycle; you're REUSING the lid one more time before it goes into the recycle bin. Glue the rock body to the legs. If the rock is more narrow or pointed at one end, make that the front. Glue google eyes or beads on the front end of the rock. Allow to dry. You're done! Set your rock frog in a potted plant or on a table where people will see it. The Panamanian golden frog, which is BRIGHT YELLOW, is critically endangered and might be extinct. Chytrid fungus is a deadly disease that scientists say may be made worse by climate change. Encourage your kids to look up some frog facts in books or on the internet, or come prepared. Always watch children with scissors. These fellows should be kept away from children under 3 years old, since they have small parts.